Happy President’s Day friends! I know I’ve been crickets here on the blog but this South Georgia weather has me convinced it’s spring and I can barely stay in the house long enough to sit at the computer! As I mentioned last week when I shared my Homemade Amish Bread recipe, I’ve been really trying to make more food from scratch lately not only to help with keeping our family healthy but also to help with the massive grocery bills I was paying to keep my three boys fed! Last week I was brainstorming healthy snack ideas and decided to make homemade banana chips and they were a big hit with my kiddos. I used to make dried fruit with my grandmother growing up and always loved it. 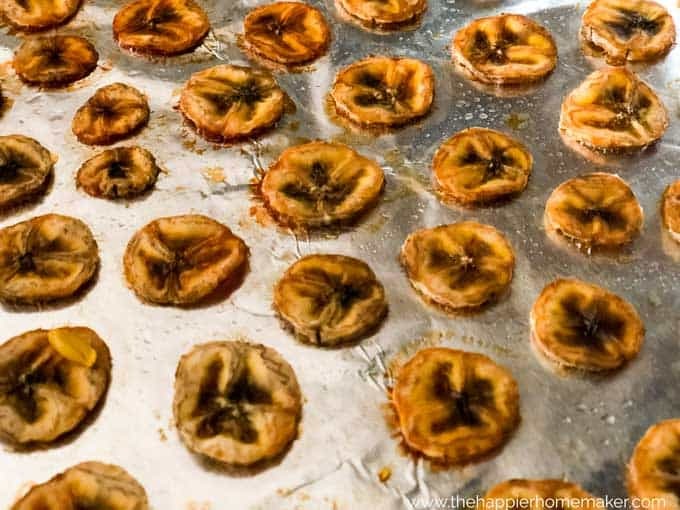 She had a dehydrator but honestly, I can’t fit one more small appliance in my kitchen cabinets so I went back to basics and made these banana chips in the oven using the same method I use to make dried orange slices for decoration in the winter. To make these all you need is bananas (of course!) and lemon juice. 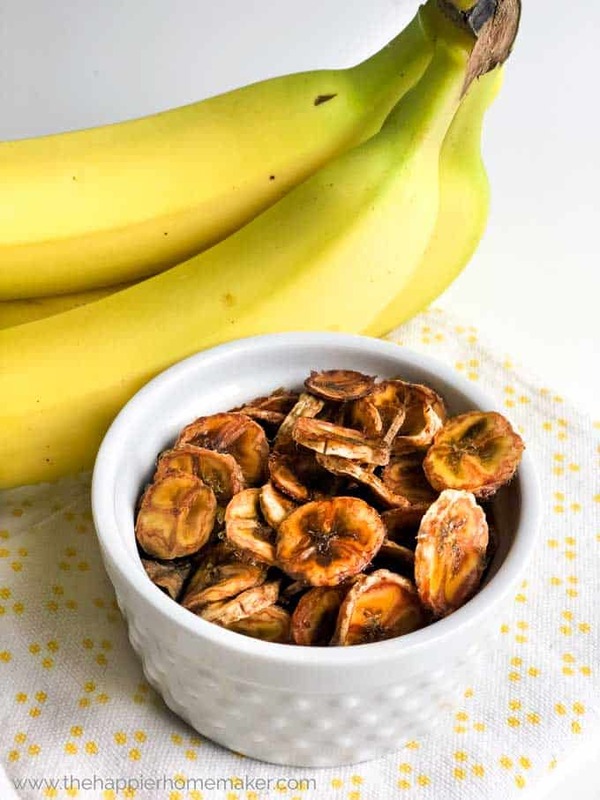 Homemade Banana Chips are an easy, affordable, and healthy snack the entire family will enjoy! Preheat oven to 200 degrees. Line a baking sheet with aluminum foil. 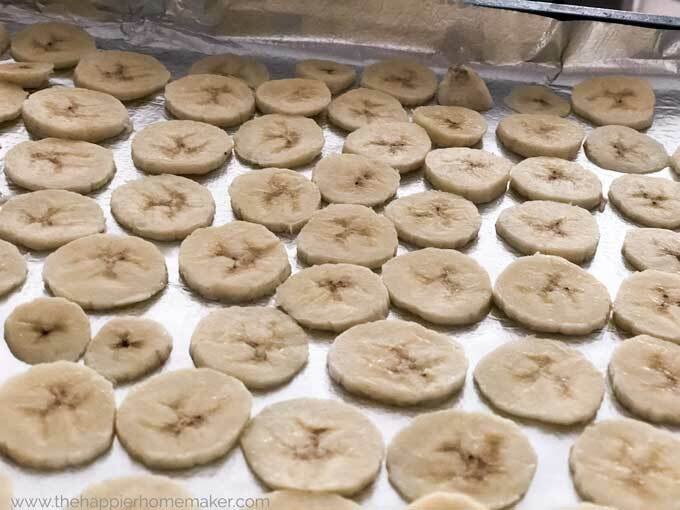 Slice bananas very thinly (the thinner, the more crisp they will turn out) and lay in a single layer on the prepare baking sheet. Sprinkle lemon juice over the bananas and bake for thirty minutes. Flip chips and bake another 30 minutes. Allow to cool completely before eating as they harden as they cool. These banana chips aren’t quite as dry and crisp as store-bought but they pack a crazy amount of sweetness so they’re perfect for those times you get a sweet craving. To make them as crisp as possible be sure to slice them very thin and allow to cool after baking. Keep in an air-tight container up to one week.